Piękne i spokojne, idealne na wakacje. Bezkonkurencyjne widoki z salonu, tarasu i sypialni. Apartament niedawno całkowicie odnowiony (kwiecień 2014), nowoczesne i starannie dobrany zestaw wystrój w wspólnocie mieszkaniowej z ogrodem i bardzo cicho. duży taras, gdzie śniadanie, obiad i kolacja z widokiem na zatokę Santander. Sklepy, bary i banki w odległości 5 minut pieszo, plaże 10 minut. Obie łazienki z prysznicem, mała wanna dla niemowląt dostępnych. Bestens ausgestattet, sehr geschmackvoll eingerichtet. Geräumig. Toller Blick auf das Meer, die Strände in Gehweite. Die Vermieter sehr freundlich, hilfsbereit und unkompliziert. Viele Informationen für Restaurants, Strände und Ausflüge waren im Appartement vorbereitet. We spent two weeks in Estella's apartment, and we had a great and very relaxing time. Everything was perfect. We enjoyed our walks along the beach, swimming in the ocean and visiting the little bodegas Estella recommended. Thank you! 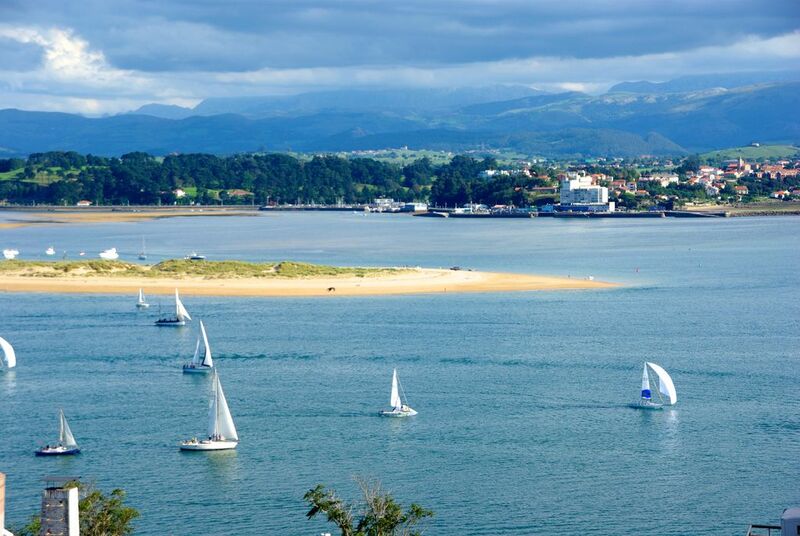 Santander is a great place to visit. It's cultural with good local tapas, although Northern Spain is generally tricky for vegetarians as our daughter discovered. The area's green and very attractive, with interesting history, buildings and beaches. Mountains and the Picos Europa National Park is a must, nearby Potes is beautiful and the cable car at Fuente De a great day out, as is Guggenheim at Bilbao. Ferry is 24ish hours and from Portsmouth usually, and is a good experience, even with a dog. We were welcomed to the apartment in a downpour by lovely patient hosts who waited for our very delayed ferry until after midnight and left us wine in the fridge. The weather was generally sunny and warm with a gentle breeze in July. The appt's central to Santander and is mid-century / artistic, with great decor and furniture. There are two extremely well appointed bedrooms with fab storage, the third room is very small but clean and tidy. Nice well equipped kitchen, could do with bigger kettle and more bowls - easily sorted. 10 min walk to beaches at Sardinero which are clean, sandy but quite busy. Try Playa de Puntal spit for dog-friendly version. Friendly, excellent local bakery 3 mins from appt. Speedy local buses or taxi's into town with easy to find central underground carparks. There's usually non or little local charging on the streets. I'd go again, it's great. We wanted to thank you so very much for sharing your beautiful home with us! Everything was perfect - the views, the comfortable beds, the interior and the location - we could not ask for anything more. It made our stay to magical to wake up to the bay, and and absolutely recommend this beautiful flat to anyone. We can't wait to return! Charlie and Georgia had so much fun in Santander - your city will always hold a special place in their hearts, and in ours. You are welcome in our home in Colorado if you ever choose to visit. This is a spacious, beautifully clean and well-appointed apartment in the quieter, more residential part of Santander. The view across the bay is exquisite and can be enjoyed from the spacious balcony. The owners are very gracious and met us at the apartment to hand over keys and show us how things work. There are washing facilities, dishwasher & lovely kitchen. We are already planning how we might go back: it was an idyllic home from home. Just back from a weeks stay in this apartment as a group of 4 adults and 2 children. We found the apartment to be perfect for our needs. Very well equipped, a luxurious finish throughout, clean, comfortable and with stunning views that have to be seen to be appreciated. The location was great for the beach. All communications with our host Estela were very good and we found her to be helpful and prompt at responding to queries. All in all we would highly recommend this property. Santander ma wiele plaż, dobre restauracje i działań kulturalnych wysokim poziomie, zwłaszcza w okresie letnim. Bilbao, a jego słynne Muzeum Guggenheima, to tylko jedna godzina jazdy autostradą.